A clever free-kick goal by Vietnamese midfielder Nguyen Quang Hai has been voted the best goal of the 2019 Asian Cup that concluded early this month in the UAE. The Asian Football Confederation ran a poll on its website http://www.the-afc.com from February 3 to 6, inviting football fans worldwide to pick their favorite among the selected ten best goals of the continental competition. Four of the top ten strikes are goals by Qatar, who won their first-ever Asian Cup after beating Japan 3-1 in the February 1 final. 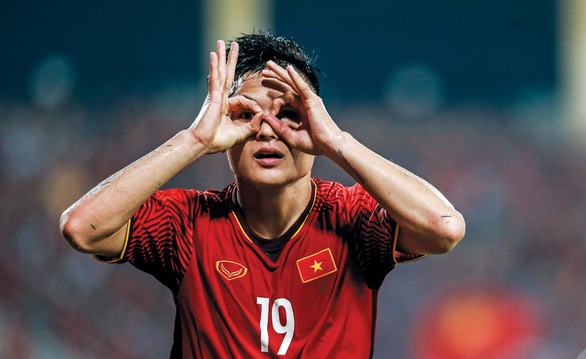 Nguyen Quang Hai was the only Vietnamese candidate, nominated for his goal in their last group-stage match against Yemen, where Vietnam won 2-0 to advance into the knockout round for the first time since 2007. The poll ended at 3:00 pm on Wednesday, with the Vietnamese midfielder receiving the most votes, 105,139, surpassing China’s Wu Lei and Qatari Almoez Ali to win the Best Goal of UAE 2019 title. Hai scored his brilliant goal by curling a free-kick from outside the box, leaving no chance for the Yemeni goalkeeper. Vietnam sealed a historic quarterfinal spot at the Cup and had their fairytale run ended with a 1-0 defeat to Japan, with the four-time champions winning by a solitary goal in a tightly-contested game late January. The ‘best goal of the tourney’ poll fielded a total of 215,854 votes, 49 percent of which went to the 22-year-old star of the Golden Stars. Wu Lei came second with 78,647 votes for his goal in the second group-stage match against the Philippines, whereas Qatar’s Almoez Ali collectively received 6,299 votes for both of his nominated goals.